Texas and Baylor are slated to play a fall exhibition this Sunday. The two Big 12 Conference rivals will meet in a scheduled 14-inning scrimmage at UFCU Disch-Falk Field in Austin, TX at 1 p.m. CDT. The exhibition is a make-up of the contest which was rained out on October 4. 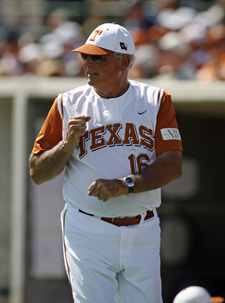 While the fall scrimmages do not count toward the teams’ 2010 win-loss records, it does count toward the teams’ maximum number of games (56) for the 2010 schedule. The Longhorns have 22 returnees from this year’s team that finished with a 50-16-1 record and a national runner up finish at the College World Series. Baylor returns 18 letter winners from a 2009 squad that finished 30-26 and made the program’s 10th NCAA appearance in 12 years. The Bears played in the Baton Rouge Regional, which saw eventual National Champion, LSU, advance. Meanwhile, Rice will hold a fall exhibition at Reckling Park in Houston, TX against longtime rival Texas State Sunday at 1 pm. Like the Texas-Baylor game, the Rice-Texas State contest is schedule for 14-innings. The Owls went 43-18 in 2009, and won the Conference USA Tournament Championship. 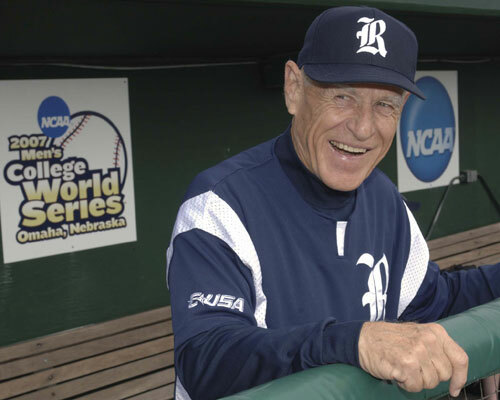 Rice hosted and won an NCAA home Regional to advance to the Super Regional round for a fifth-straight year before falling to LSU in the Baton Rouge Super Regional. The Owls open the 2010 season with a three-game series on the road at Stanford on February 19th. Texas State made it to an NCAA Regional in 2009. The Bobcats finished with a 41-16 record after losses to Boston College and Army at the Austin Regional. CLICK HERE to read “Growing College Baseball”; Collegebaseball360.com’s thoughts on how to make fall baseball even better and grow college baseball at the same time.